I’ve finally found the time to read Patrick Cockburn’s wonderful book, which brings together his invaluable observations from the last five years in Iraq. I strongly recommend it, not least because the bravery which goes along with reporting from this part of the world deserves some reward. 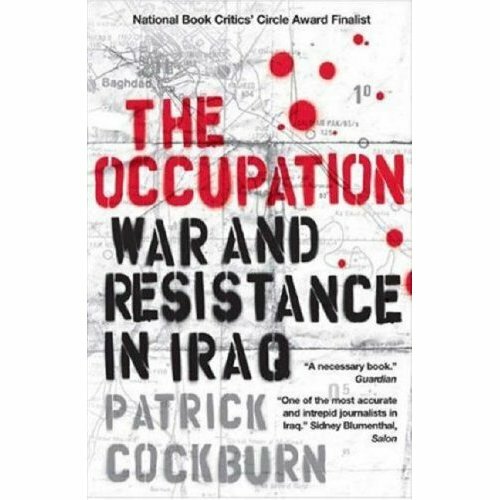 Cockburn’s personal and accessible narrative showcases the courage required of anyone who has voluntarily travelled to Iraq to bring back the real story of the US and UK-sponsored occupation. One of the principle features of the book is its personal and anecdotal flavour. Cockburn constantly ensures that all levels of the conflict – from international politics, to internal sectarian divisions, to personal experience – are covered. Without all of these angles, the situation cannot be fully understood. He also shows how the rhetoric of the US and the UK has been doctored to tie in with their domestic political situations. This is how Prime Minister Allawi was forced on several occasions to retract what he had said previously; it did not tie in with the more positive story the coalition of the willing wished to present. Cockburn’s story is carefully nuanced; he does not heap blame on the US and absolve all other parties. He is particularly critical of the Sunni insurgency, and its destabilising war against the Shia population. His connections with Sunni, Shia and Kurdish Iraqis, as well as foreign journalists and US bureaucrats, help him paint a very moderate picture of a radical situation. Nonetheless the critical situation is ultimately laid at the feet of the West. Cockburn, who has long covered Iraqi affairs, seems particularly concerned with the fact that the invasion was designed by elites with little knowledge of the complexities of the country. The imperial clique in Washington was of the opinion that such luxuries were not necessary or even desirable. The reader is shown that such arrogance inflamed an already catastrophic situation; important figures were ignored and marginalised, whilst long-term expatriates, who no longer had sufficient connection to their country, were pushed into positions of power. The arrogance has also translated into a prevailing opinion within the US that there is an elusive ability on the part of the coalition forces to ‘get it right’; however as Cockburn shows in the book and pointed out in last Monday’s Independent, “the US does not control the political weather in Iraq”. Cockburn also criticises the US for its preoccupation with the insurgency, which, whilst understandable, meant that the growing crime and day-to-day instability in the country was ignored. Roadside bombs affect the political situation in America, but it is the kidnappings, robberies and corruption which tear apart Iraqi society and delegitimize the occupation. Cockburn’s book provides a much needed wide-angle view of the situation in Iraq; a perspective which can be hard to come by, overwhelmed as it is by the daily news of death and destruction. Whilst it is occasionally a little light on the sources, and devoid of the statistics that would add weight to his recount of the terrible situations with which he has become all to familiar, this can be forgiven. It is the human touch that makes this such an important book. To understand the insurgency, and to understand where the country may turn next, it is important to understand the mood, mindset and motivation of the Iraqi people. Cockburn provides this in droves.